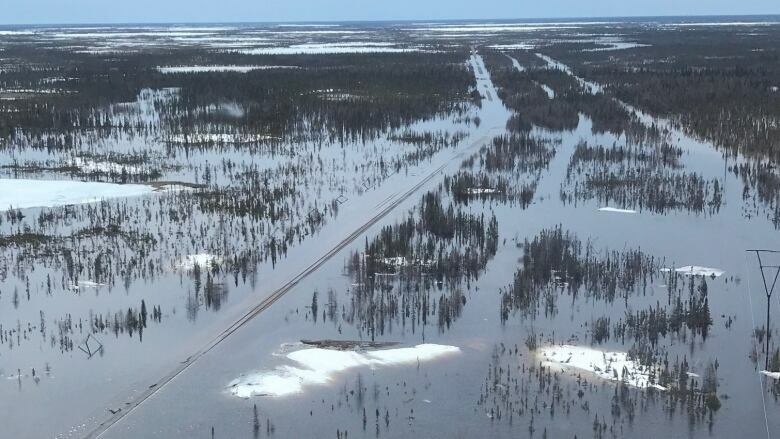 Owners of the Hudson Bay Railway have to inspect almost 300 kilometres of track before completing an assessment of damage caused by flooding this spring, the company said Thursday. The owner of the Hudson Bay Railway, which provides rail service to Churchill, is urging residents and governments to find alternate ways of shipping goods into and out of of the northern Manitoba town, since just assessing damage will present extreme challenges. Omnitrax has to inspect almost 300 kilometres of track, 28 potentially compromised bridges and 600 culverts for damage caused by flooding and washouts this spring, the company said Thursday. Engineers have already located 24 breaks in the line — up from a previous tally of 19 damaged sections on the line earlier this week. "It is extremely important for everyone to look for alternative transportation solutions," said Peter Touesnard, chief commercial officer with the Denver-based Omnitrax in an email to CBC. The company said it does not expect to have trains running again between Gillam and Churchill until spring 2018 at the earliest. Transport Minister Marc Garneau said his department is "developing a plan" that will ensure both the port and airport in Churchill are able to pick up the slack until trains can run again. He promised ships will be an option for resupplying the community. "It's something that's been done many times before and can be done again," he said in a scrum Thursday. A ship from Montreal has already arrived, resupplying the town's hardware store before heading further north to make deliveries to communities in Nunavut. Dale Demeulles, who owns Churchill's Home Hardware, said he's in the process of figuring out how much more to order before the second and final ship before freeze-up leaves Montreal. Churchill resident Diane Stevens said she does not believe government is doing enough to address immediate needs in the community. 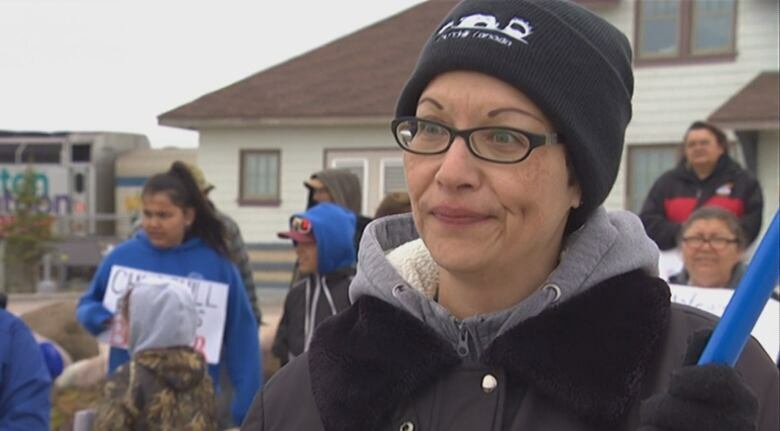 "They're blatantly ignoring us here," she said at a protest Thursday in the town. "Even though it's an American who owns the rail line, Churchill is still in Canada, right? Do something for us." Stevens said many of her neighbours are struggling to find work and pay for groceries. "It's very heartbreaking," she said. Churchill is still chilly in June — on Thursday the temperature hovered just above zero. Stevens said she is worried about people in town who may not be able to heat their homes much longer. "I run with electric heat but there are a lot of people in town and businesses in town that run with propane. We're running low on propane," she said. Fuel, like many heavy goods, was shipped to the town by rail. Stevens, like many other protesters at Thursday's rally, called for repairs to the railway to start immediately. Work to repair the Hudson Bay Railway is not a small undertaking, according to Omnitrax's Touesnard. "The mobilization of personnel, equipment and materials is extremely challenging given the isolated nature of the line," he said. The damage assessment alone is expected to take four weeks. After that, repairs could take upward of a year. "Until the full inspection by engineering professionals on the ground is complete, it is impossible to estimate the time and money required to repair the line," Touesnard said. "While it is our intention to move the project along as quickly and as safely as possible, we don't have confidence that it will be open before the winter season." In the House of Commons Thursday, New Democrat MP Niki Ashton, who represents the riding of Churchill—Keewatinook, described the closure of the railway as sudden isolation. She is demanding the federal government re-nationalize the Port of Churchill and the railway — purchased by Omnitrax from then-Crown corporation Canadian National Railway in the mid-1990s after Liberals deregulated the rail industry. "Businesses are hurting, people are hurting. We need immediate federal action," she said. "What Churchill is facing is a national disgrace. Our north deserves better." In response, Transport Minister Garneau said Canada stands ready to aid any province or territory that requests it but did not respond directly to the proposal to buy back the port and Hudson Bay Railway.